A selection of some of Sky Lynx finer lines in the Generation 1 Cartoon. 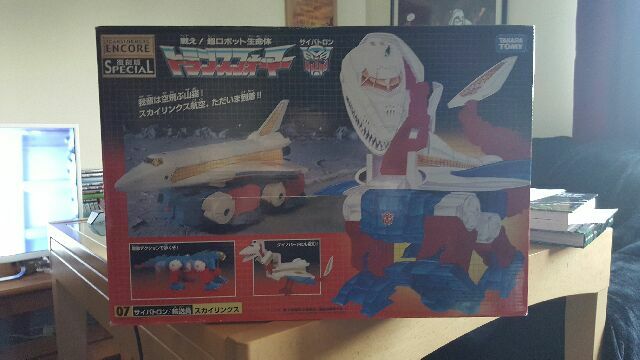 So, Sky Lynx arrived. He was always one of my favourites because his egotism and supreme confidence made him comical. So, after having him on my wish list for a long, long time, it was nice for him to finally arrive. And, an added bonus, the packaging is the packaging from the 1980s toyline. Probably because he is a 1980s toy. I have a lot of fond memories of opening boxes that looked just like that, with some pretty nifty artwork on the back, along with the biography of your new toy. Going to my nostalgic happy place, I opened my new addition and was reminded that as part of the fun, I would need to apply the stickers. One episode of Battlestar Galactica later, I had applied stickers and figured out the transformations. He was not actually terribly difficult to transform. The legs on the cargo module/puma are a bit loose, though that could be down to the fact that the toy is almost as old as I am. The tail of the shuttle/dino-bird was fiddly, but I got there, as you can see. It would appear Commander Modesty is indeed here. He is now on station guarding my graphic novels, ready for me to play with him at a moment’s notice! one of the most random characters in the G1 line! Ah….Transformers, one of the true gems of my childhood. It has been and always shall be, one of my alltime favorite cartoons 😊 This looks awesome. My favorite Transformer set, and one I still want to own one day is Scorponok. Great post! If I could figure a way to screen capture my TV I’d replay TF Devastation on my xbox. Loved trashing Devastator with sideswipe.